Since Hadleigh, Melody and Bex-the best of best friends-entered into a marriage pact, two of them have found (and married) the men of their hearts. But Bex doesn't think she'll be as fortunate as the others. Her own first love died years ago in a faraway war, and Bex has lost hope for a happy marriage of her own. She concentrates on her business, a successful chain of fitness clubs, instead. Then, when single father Tate Calder comes to Mustang Creek with his two sons in tow, who befriend Bex's eight-year-old nephew, she and the handsome, aloof newcomer are constantly thrown together. But is the marriage season over? Or can a man with doubts about love be the right husband for a woman who wants it all? I think this was my favorite out of the three. I really liked how Bex and Tate worked through their differences to get to their HEA. Added three boys and three gargantuan puppies was just icing on the cake. The Marriage Season is a story of hope. Two people despite having been unlucky in love in the past are on the verge of trying again. 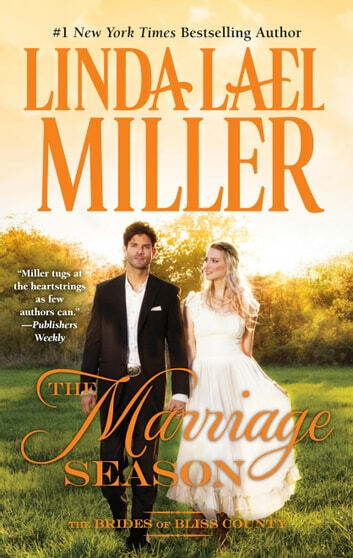 Linda Lael Miller has written a story that has adorable moments and endearing moments. These all come together to create an emotional dramedy that touches the heart. I received an ARC of The Marriage Season an honest review. A MUST READ JOURNEY. I have read the three books, the marriage pact, charm and season. I loved them all. I like the connection with the children and animals.